Gareth Dunsmore: "With Formula E, it's all about zero emissions and electric, but the real key for us is that fan engagement." Starting late this year, Nissan will join the Formula E all-electric racing series. 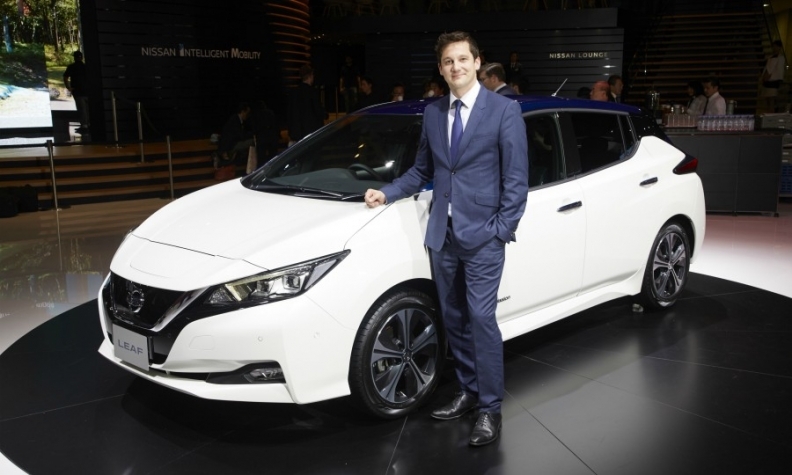 The automaker's European boss for electric vehicles, Gareth Dunsmore, sees the move as a great opportunity to put the recently launched second-generation Leaf in front of a new group of potential customers. He explained why to Automotive News Europe Managing Editor Douglas A. Bolduc. Will Nissan's move into Formula E help to make EVs sexier? It absolutely shows EVs are exciting. I've driven a Nissan Leaf since 2012 and I've got this knowing Leaf smile. Every Leaf customer has it. It's a sort of smug satisfaction that you know something that the guy driving an internal combustion engine car next to you doesn't know. That is the excitement you get from the instant torque. What better way to demonstrate that than with Formula E? Will this move help you reach a new customer group? Nissan has been committed to putting its investments into global sporting competitions to portray our brand message to more customers. A prime example is our involvement in the Champions League. That has given us the ability to tell our stories and to engage with many people who wouldn't normally be looking for a car brand in that setting. Combining the expertise that we've built up in racing to go into Formula E with our EV expertise is a natural next step for us. What message do you want to send with the move into Formula E? With Formula E, it's all about zero emissions and electric, but the real key for us is that fan engagement. There is a big difference between seeing something on TV and experiencing it or hearing about it from a friend or from a family member who has engaged with it. MAIN CHALLENGE: Extending Nissan's early lead in electric cars with the new Leaf. The first Leaf's battery accounted for a huge portion of the car's total cost. How has that improved? I can't give you a breakdown of the cost proportion of the vehicle, but I can say that the industry has reduced battery costs while also adding range. The new Nissan Leaf, which is the first car to undergo WLTP tests, can travel 270km in a combined environment (city and highway) and 415km in city conditions on a single charge. That means many customers in Europe will only need to charge it once a week. It's also important to provide the right level of durability. We've done more than 3.5 billion kilometers and there are zero battery failures. The third factor is cost. We're adding kilowatt hours but we need to make sure we're keeping the costs competitive. How much have battery costs shrunk? Industrywide, we've seen the cost tumble from about $1,000 per kilowatt hour to $100 to $400. How many Leafs are on the road in Europe? We have more than 84,000 people who are driving their electric Leafs every single day. China is making a big push into electrified powertrains. Will Europe and China continue to be the markets that drive this movement? From a Nissan perspective, for the last two years Europe has been the No. 1 region for EV sales. The speed of growth in China is exciting for the whole industry. With Nissan's intelligent mobility technologies, we can expand over the next 18 months in markets that are just taking their first steps [toward EV acceptance]. This includes Germany, the Netherlands and Austria. They offer huge growth potential for us, which is largely untapped. With the new Nissan Leaf and e-NV200, we will be tapping into them. How will you keep your first-mover advantage in Europe as more competitors enter the sector? In Europe, for the next 18 months, we are standing alone. We are offering our customers a viable choice in electric mobility with the Nissan Leaf and the e-NV200, both with a longer range than before, both at an accessible price. We welcome the competition because there needs to be consumer choice in the marketplace. People need to be aware there are options. When they are aware, we're pretty confident about our chances because we're offering an EV with the right range at the right cost with ProPilot [driver assistance] technology, with [automatic] parking and with the ability to integrate and share your energy and share your vehicle. Are you excited to see suppliers such as LG Chem and Samsung adding battery production in Europe, where for years only Nissan and alliance partner Renault were producing them? There are more and more of these companies. They will drive the cost down. In the long term, it's about them having the flexibility to be able to access the batteries that provide the right range, the right durability at the right cost. The technology will improve and the alliance wants to put itself in the right position to be able to take advantage of this. Will you switch to solid state batteries? Every battery technology is interesting to us at the moment. In the midterm, we've got our 40-kilowatt-hour [lithium ion] battery. We'll introduce a longer-range battery next year so we're pretty well set. As we move into the mid-2020s and beyond, that's when different options become interesting. We'll continue to monitor that. From an alliance perspective, we've got the buying power and the flexibility to be able to step up into the next technology, whatever that might be.